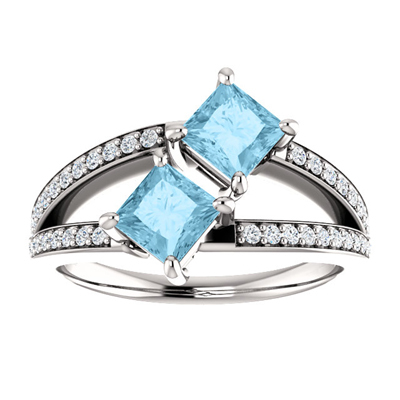 Experience the light and gentle color of the two 4.5mm aquamarine gems on this engagement ring. The princess cut effects on these two gems fit in perfectly with the 14k white gold design. The 46 diamonds featured on the band also have deep cuts that add to the appearance of the ring. We guarantee our 4.5mm Princess Cut Aquamarine and Diamond 2 Stone Ring in 14K White Gold to be high quality, authentic jewelry, as described above.